The project deals with introduction of digital services in a hospital environment, and aims to optimize the customer flows within it. It approaches hospitals as complex physical/digital environments that call for a holistic approach towards designing for customer experiences. While digitalization of services can provide value in terms of increased flexibility and efficiency of services, the specific criticalities of the healing systems require a holistic approach to the variety of human needs. 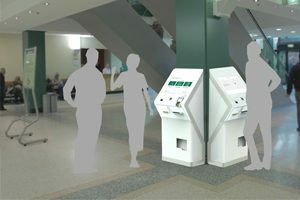 The design goal is the improvement of the patient experience with respect to the administration services within the hospital location, and the solution is expressed in terms of a system integrating human and technological touch-points for the deployment of administration practices related to the care services.